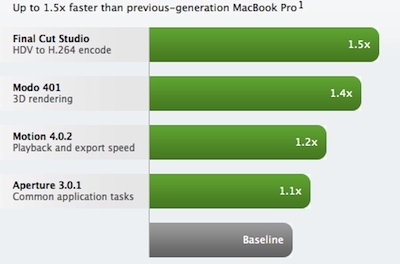 Before MacBook Pros were announced it was rumored that Apple will use NVIDIA’s new Optimus technology for automatic switching between Intel’s integrated graphics and NVIDIA discrete graphics chip. However, recent findings by AppleInsider indicate that even though the concept used by Apple is similar to NVIDIA Optimus, the automatic graphics switching solution has been completely developed by Apple. NVIDIA’s spokesperson also confirmed that the company had no input on Apple’s solution. Apple today updated the MacBook Pro line with faster processors, powerful next-generation NVIDIA graphics and even longer battery life. The popular 13-inch MacBook Pro features the new NVIDIA GeForce 320M graphics processor for up to 80 percent faster graphics and a groundbreaking 10-hour built-in battery. The new 15-inch and 17-inch MacBook Pro models feature Intel Core i5 and i7 processors and Apple’s new automatic graphics switching technology that toggles seamlessly between powerful NVIDIA GeForce GT 330M and energy efficient Intel HD Graphics processors. 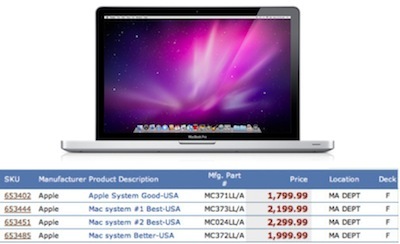 Over the weekend a MicroCenter employee posted screenshot showing four new Apple SKUs for upcoming MacBook Pro update. The screenshot showed Apple System Good-USA for $1,799, Mac System Better – USA for $1,999, Mac System #1 Best – USA for $2,199 and Mac System #2 Best – USA $2,299. Indicating that the lower end 15-inch MacBook Pro will see a $100 price increase, whereas the top of the line 15-inch model will see a $100 price drop and 17-inch model will see $200 price drop. 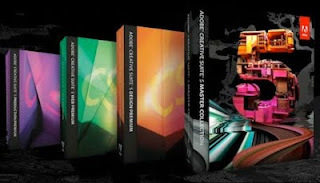 Adobe today announced Adobe Creative Suite 5 – design and development software for virtually every creative workflow. Featuring integration with online content and digital marketing measurement and optimization capabilities for the first time, Creative Suite 5 products include access to signature Omniture technologies, to capture, store and analyze information generated by Web sites and other sources. Additionally, a brand new component, Adobe Flash Catalyst, joins the Creative Suite, ushering in the ability to design interactive content without writing code and improve the collaborative process between designer and developer. Microsoft today announced KIN, a Windows Phone designed specifically for people who are actively navigating their social lives. 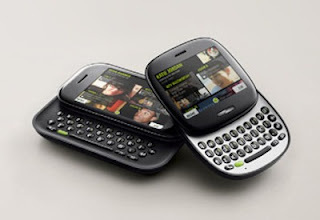 Microsoft has partnered with Verizon, Vodafone and Sharp to bring the phone to the market. According to the company, KIN is designed to be the ultimate social experience that blends the phone, online services and the PC with breakthrough new experiences called the Loop, Spot and Studio.